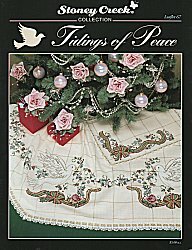 Gorgeous doves, ribbons and roses adorn a tree skirt and coordinating placemats in traditional or Victorian Christmas colors. Chart only. Originally designed for 28 ct gold Silvretta tree skirt and placemats. Design size of left and right sides of tree skirt is approximately 16 1/4"w x 11"h (227w x 154h Stitches). Design size of the placemat pattern is approximately 12 3/4"w x 7"h (178w x 97h Stitches). Specialty threads used are Kreinik 032 pearl and 002 gold blending filaments. Tree skirt, placemats and threads sold separately.